Mohammed Salah (right) scored the winner for Liverpool against Brighton. 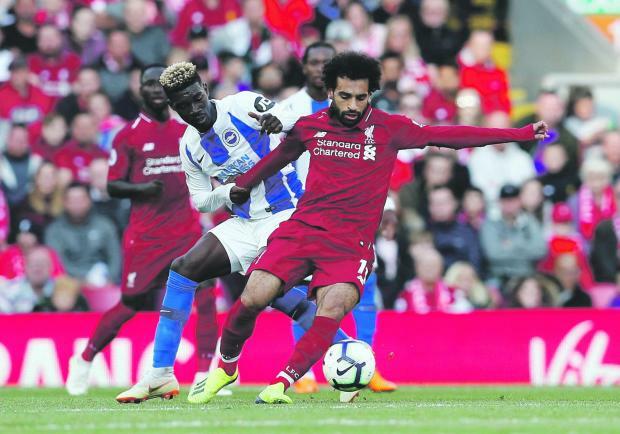 Mohamed Salah struck again to ensure an underpowered Liverpool maintained their perfect early-season record in the 1-0 win over Brighton & Hove Albion at Anfield and climbed to the top of the Premier League on Saturday. Salah, the league's top scorer last year, scored the first-half winner to give Liverpool nine points from three matches after Manchester City's spotless start to their title defence was halted by a 1-1 draw at newcomers Wolverhampton Wanderers. On a day when Arsenal earned their first win under Unai Emery, a 3-1 victory over West Ham United, the two title favourites, while far from their best, both dominated their matches but with very different outcomes. It earned a lacklustre Liverpool a two-point lead over unbeaten Manchester City and Bournemouth, although Chelsea, Watford and Tottenham Hotspur all have chances to join them on nine points in matches to be played on Sunday and Monday. Arsenal prevailed after two defeats under Emery but only after Marko Arnautovic's first-half goal for West Ham prompted brief thoughts that the home side might lose their first three league matches of the season for the first time since 1954-55. Emery, reckoning that it was an important win for the fans, dismissed rumours of a row with Mesut Ozil, saying the midfielder was not on duty because of illness. "No problem with the player. It isn't true, that information," Emery told reporters. "I don't know who started it but if you ask me, the doctor, or the club, he was sick." Everton's new Brazilian strike hero Richarlison was dismissed for a headbutt aimed at Adam Smith just before the break while Smith himself was sent off for a second half foul on Theo Walcott. Southampton's difficult start continued with Harry Maguire's stoppage-time winner seeing Leicester City earn a 2-1 comeback win, a victory that will have brought much pleasure to visiting manager Claude Puel on his return to his former club.